Araldite is a registered trademark of Huntsman Advanced Materials (previously part of Ciba-Geigy) referring to their range of engineering and structural epoxy, acrylic, and polyurethane adhesives. The name was first used in 1946 for a two-part epoxy adhesive. Araldite adhesive sets by the interaction of a resin with a hardener. Heat is not necessary although warming will reduce the curing time and improve the strength of the bond. After curing, the joint is claimed to be impervious to boiling water and all common organic solvents. It is available in many different types of packs, the most common containing two different tubes, one each for the resin and the hardener. Other variations include double syringe-type packages which automatically measure equal parts. This type of packaging, however, is not exact and also poses the problem of unintentional mixing of resin and hardener. In the UK Aero Research Limited (hence the name; ARaLdite) developed this new synthetic resin adhesive for bonding metals, glass, porcelain, china and other materials. The first production of epoxy resins was carried out by De Trey Frères SA of Switzerland. They licensed the process to Ciba AG in the early 1940s and Ciba first demonstrated a product under the tradename Araldite at the Swiss Industries Fair in 1945. Ciba went on to become one of the three major epoxy resin producers worldwide. Ciba's epoxy business was spun off and later sold in the late 1990s and is now the advanced materials business unit of Huntsman Corporation of the US. Araldite adhesive is used to join together the two sections of carbon composite which make up the monocoque of the Lamborghini Aventador. The use of Araldite adhesive in architecture to bond thin joints of pre-cast concrete units was pioneered by Ove Arup in Coventry cathedral and the Sydney Opera House. At Coventry cathedral, Araldite adhesive was used to bond its columns and fins, while at Sydney Opera House, Araldite adhesive was used to bond the rib sections of the shells, since a traditional concrete joint would have slowed construction, as it would need 24 hours to cure before stressing. Highmark Manufacturing uses Araldite epoxy resin in the manufacture of advanced ballistic protection body armour. Schlösser Metallbau, a manufacturer of metal parts for railway carriages, uses Araldite epoxy resin to bond aluminium profiles of cab doorframes on the BR 423 Siemens Bombardier tram. Fischer Composite Technology GmbH uses the Araldite RTM System to produce carbon composite side blades for the Audi R8. Araldite epoxy resin is commonly used as an embedding medium for electron microscopy. Some Flamenco guitarists (e.g. Paco Peña) use it to reinforce their fingernails. Brian May used it to seal the pickups in his homemade Red Special guitar to prevent microphonic feedback. 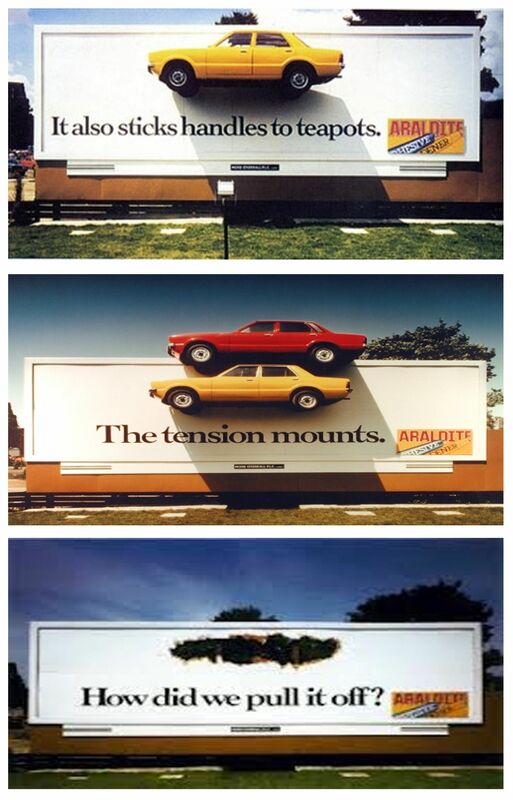 In 1983, British advertising agency FCO Univas set up a visual stunt presentation of the strength of Araldite adhesive by gluing a yellow Ford Cortina to a billboard on Cromwell Road, London, with the tagline "It also sticks handles to teapots". Later, to demonstrate more of its strength, a red Cortina was placed on top of the yellow Cortina, with the tagline "The tension mounts". Finally, the car was removed from the billboard, leaving a hole on the billboard and a tagline "How did we pull it off?". ^ Seymour, Raymond B. (April 1981). "History of the Development and Growth of Thermosetting Polymers". Journal of Macromolecular Science, Part A. 15 (6): 1165–1171. doi:10.1080/00222338108066459. ^ Jones, Peter (2006). Ove Arup. Yale University Press. pp. 215, 248. ISBN 0-300-11296-3. ^ Murray, Peter (2004). The Saga of Sydney Opera House. Taylor & Francis. p. 54. ISBN 0-415-32521-8. ^ "Araldite Adhesive of Choice". EPPM Magazine. 5 (3). April 2003. Archived from the original on 2008-01-13. ^ "In Style". Adhesives & Sealants Industry. 1 February 2008. Retrieved 2015-06-30. ^ Hayat, M. A. (2000). Principles and Techniques of Electron Microscopy: Biological Applications. Cambridge University Press. p. 98. ISBN 0-521-63287-0. ^ "Paco Peña, Desert Island Discs - BBC Radio 4". BBC. This page was last edited on 29 November 2018, at 17:56 (UTC).